Browsing the web can be troublesome with all the trackers and malicious ad scripts. Android platform has plenty of ad blockers that can block such scripts yet they are not effective in their approach. Brave browser is one app in the Google Play store that attempts to solves this problem. In this article, we are going to take a look at some of the features of this Android App. Ad blocking apps are breaking the web and making it harder for publishers to keep the websites running. 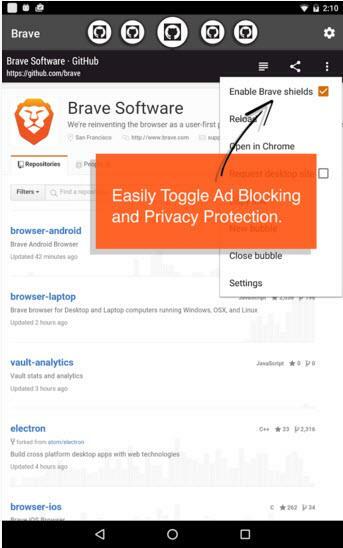 Brave is an attempt to address this issue by implementing a better revenue model right inside the browser. Most of the browsers are suffering from the issue of intrusive ads and the spyware scripts. Brave browser is tackling this issue by using built in filters. So by using this browser you're going to be free from all the trackers and ads. This can not only be going to help boost the speed but also saves your bandwidth. In this process you may find that most of the publishers are going to lose the revenue. And for that reason making money from content online is going to be harder. Brave is trying to tackle that issue with their shared revenue model. Though there are lot of loopholes with this approach, but still it is worth taking a look at. The brave browser seems to be handy way to surf quickly without any of those nasty ads. Most of the intrusive ads are going to be removed or replaced with clean ads. Though browser claims to remove all the ads from the service, instead It places alternative ads. These alternative ads are small in numbers. Most of them are appear on usually 1 per page. Also they don't get in the way of the reading experience. Mostly they are placed at the end of article or in the whitespace. You may also find some of the ads within the text in some cases. Though browser doesn't try to make use of every ad placement on the page, it keeps the ratio to minimum. The revenue generated from these ads is pooled and distributed. As of now the ads used in the system are not at all annoying. However in future some advertisers may want to push a bit glittery ads. For this reason company may step in and correct it to avoid loss of revenue. But for now there is no issue with intrusive ads being displayed. Brave software distributes the revenue with focus towards the publishers. As the publisher of the website makes the content, so they are favoring them with 55% of the pooled revenue. Remaining 45% are allotted to the user, company and ad partners. These three get the 15% of the revenue within each revenue cycle. So in theory this scheme is win-win for everyone involved in the model. However there are many practical issues while implementing this model. And for this reason there is not much publisher interest being shown into their product. If they make the system more transparent then chances of better revenue are much higher. Company wishes to include micro-payments and also different payment methods to pay the publishers from around the world. The browser is currently facing the legal issues with the group of newspaper websites and the advertisers. They are claiming brave to be misusing the revenue distribution model. Also they have some of the other claims against the browsers attempt to downplay publisher content. Some of the legal issues stand strong considering the official website has no place for publishers to sign up. So in such case where the revenue is going and how the users are getting paid, remains the unanswered question. If the company behind does not come out with some strong appeal then this may not be the right browser. As the browser would play part as yet another place for digital piracy. Privacy can be managed on the app with simple button. So it's easy to tackle the ad trackers. Making money from online content is difficult. With changing technology every year, you can find that it's lot harder for publishers to make money. This is one reason many publishers are going behind the pay wall. And this often puts off many users as they can't pay for the content on every place. So the unbalance remains on web with struggling publishers who wish to keep their content online. Another concern is that the company being in a startup mode has yet to establish the trust. This makes many established publishers to not trust their model of revenue distribution. In theory however the model is very profitable for the publishers and users alike. Brave is an excellent attempt to address some of the issues with ad blocking and publisher revenue. However at the current stage the half baked attempt from this browser is hurting the publishers. Though the browser source code is open but the revenue distribution model is closed. So there is no way to verify the payments being properly distributed. In short we have to take the word of the company and trust them on it. In future however, this browser may hold some value for both users and publishers. Know about the best available Android apps for internet browsing for your android smartphone like Opera Mini, Chrome, UC Browser, etc. Read about their features and what are their unique qualities which might be relevant to you. 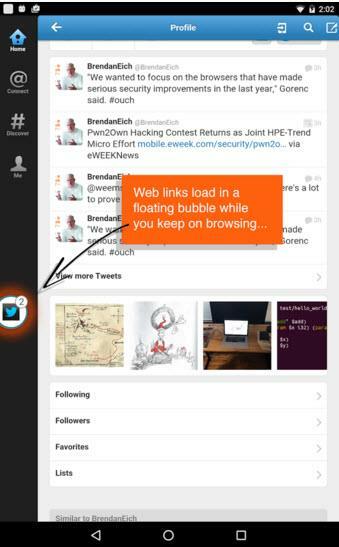 This article presents the top 10 best Android web browsers. Read on further and find out which Android web browser is best for you.